As you can see, our bedroom was in dire need of a makeover. Not being one to spend a shed load of money on my makeovers, I decided to change the accessories and art for a low cost, high impact result. Clearly Beach Dwellers, something had to be done. 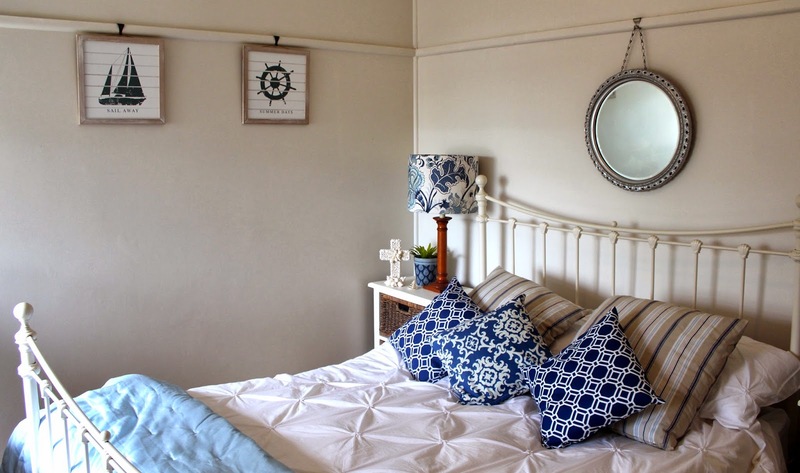 All the furniture remained the same, but for a few hundred dollars, or in this case probably less, because I shopped the house, you can have a bedroom which feels refreshed and inspiring. First, I always start with a mood board. I lay everything out on the bed to decide what's in and what's out. When I got the art work onto the wall, it was clearly too small for the space and a little down market for the other pieces in the room. In hindsight, I would prefer to see that art in a boys nautical bedroom, or a boat house. I needed something bigger and at short notice. You know I love to use what I have. This collage was done by a friend some years back, when he wanted to practise his photography. It hasn't had a run since we moved here, nine years ago and I thought it might remind Mr Beach house of the girl he married. It fits the space and will be fine until I see something with wow factor. When the collage was put together, the idea was meant to be, the 'moods of Carolyn'. Some of the shots are emotionally a little dark, but they are all honest. 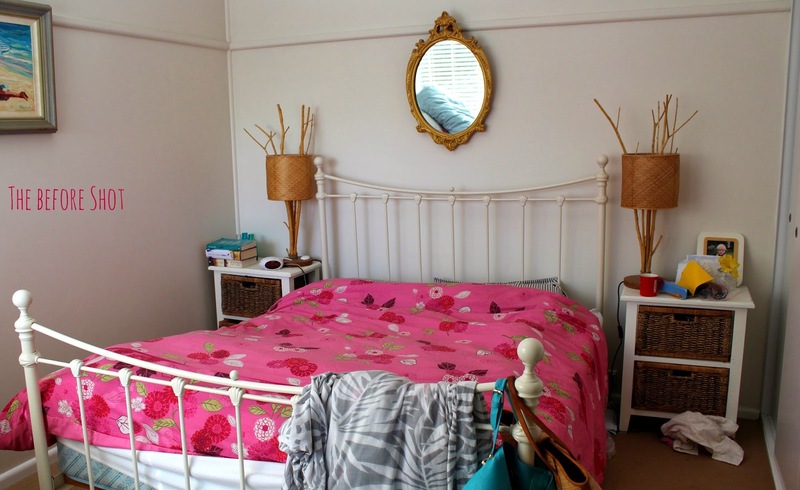 Despite that, I think the collage ties in well with the plaster framed mirror, over the bed. Not bad for a road side find, which I brought back to life with some silver paint. 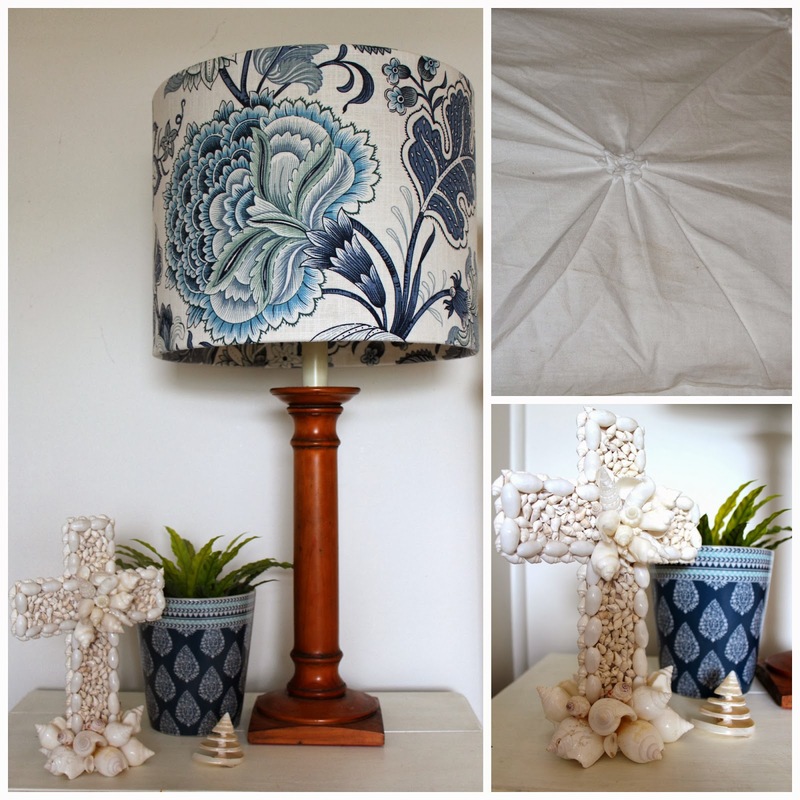 As for the accessories , some time ago I covered an old lamp shade I already had and bought another lampshade the same size to cover. The lamp stands were some I had from 25 years ago. They are rather beachy and although they have been for sale on my vintage stand several times, they never sold, so I decided to use them. I think they have a classic American feel to them and of course, now I' m happy they have stayed with me. 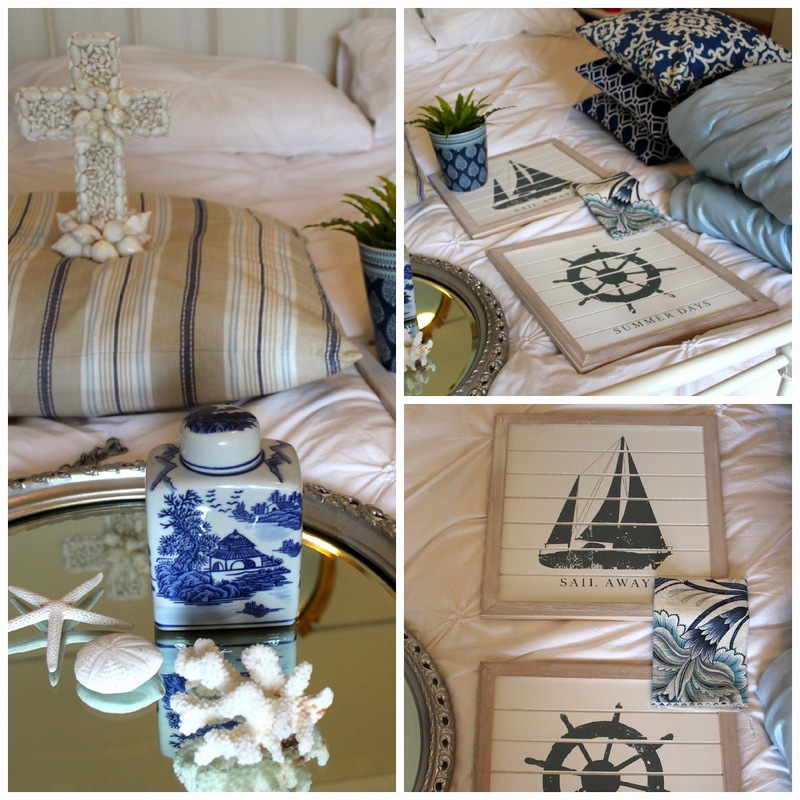 Of course no coastal makeover is complete without some shells and coral. Throw in some white roses in an enamel jug and some greenery in a plant holder to add interest. One hard and fast rule of decorating, is that every room should have something 'living' it. Ironically, that includes faux plants, as is the case with the mini birds nest fern, in this scenario. As for cushions, these are really the essential accessory for a makeover, because they tie the whole look together. The two geometric ones at either end, are actually the same colour, although they don't look it here. 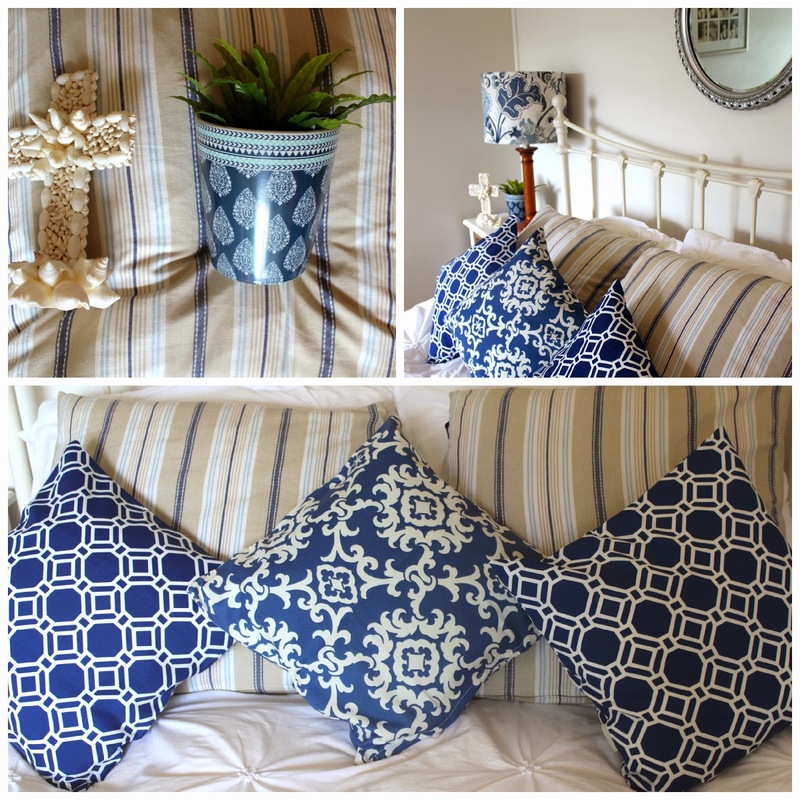 Cushions can be used as inspiration and a way to pull all the colours together. The striped ones in the back, were really my inspiration for the colour scheme. Over all I think the look is very fresh and calming. 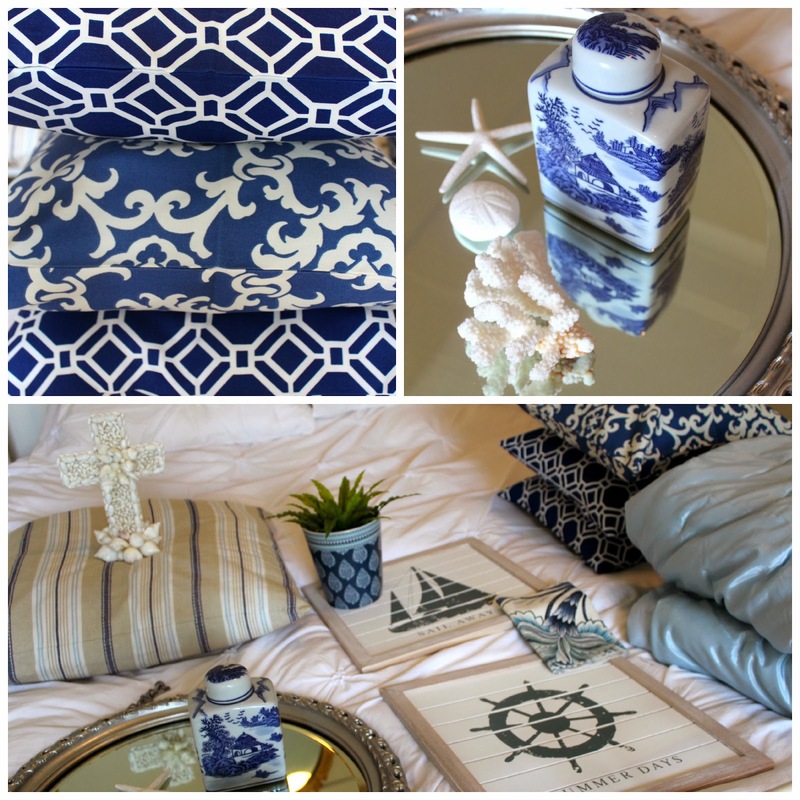 Perfect for the relaxed feel of a Beach House. Have you got a bedroom makeover in mind? Beautiful Carolyn, very fresh and serene. Don't you just love bedknobs? The perfect storage solution for anything that hangs? LOL Those photos of you are beautiful. 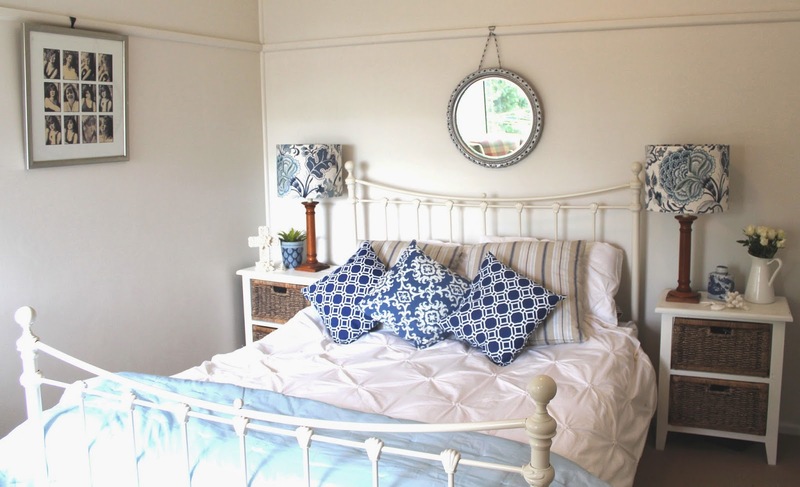 Cushions do make the room, don't they? Love it! Gorgeous. I love that mirror, what a score! I love this, so beautiful. Some really good ideas here! It really looks lovely now. I am sure if your tried to sell the lamps now they would sell instantly!AriadnefromGreece! I love the lampshade and the artwork. Just gorgeous. 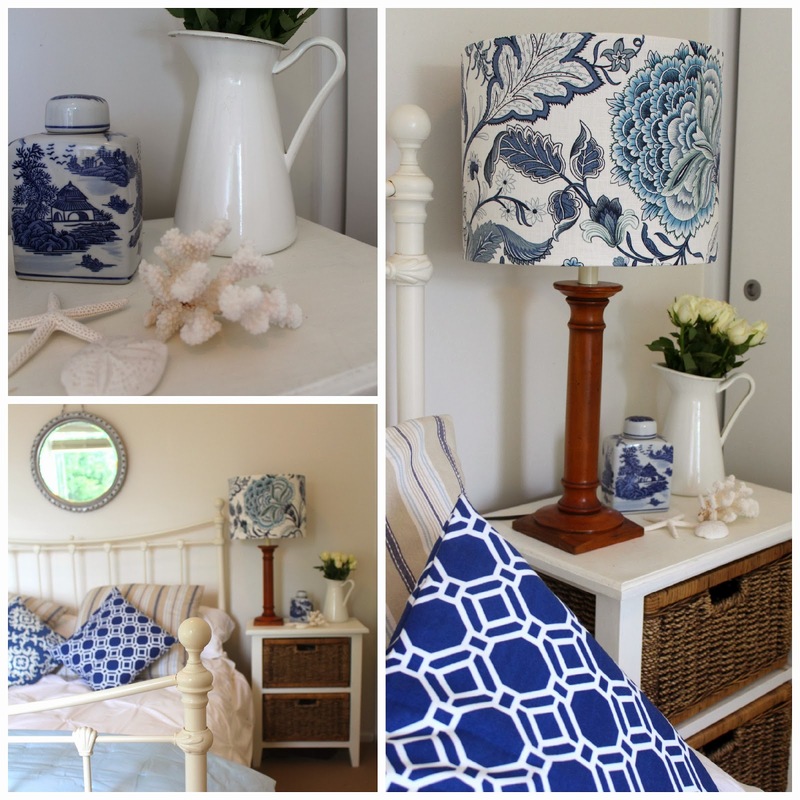 Blue and white (just like your blog) is so simple yet effective. I love it! 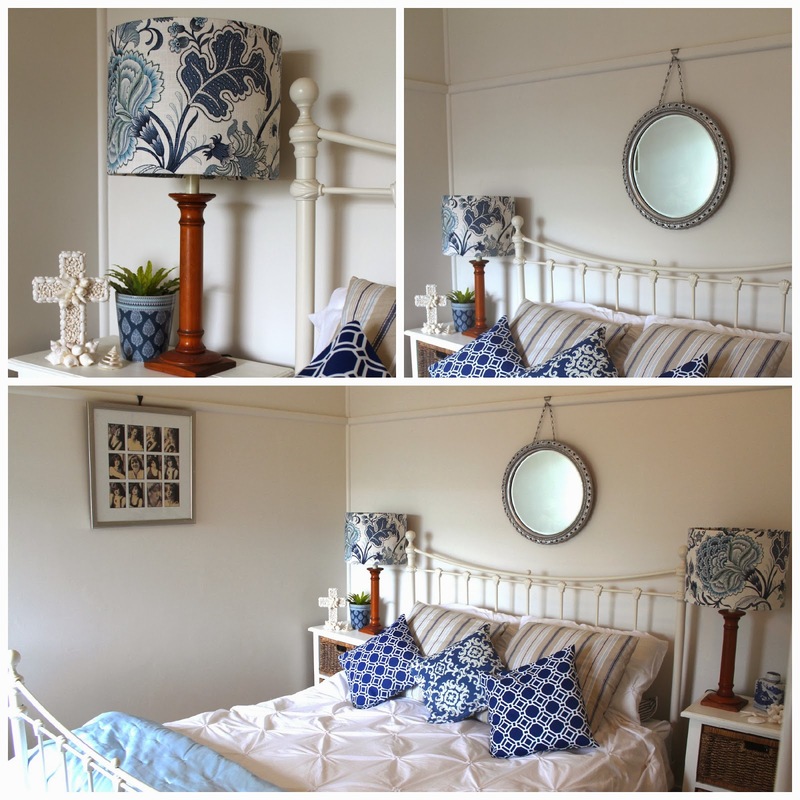 Love the material on the lamps, the side tables, the moods frame, the bed design, the decanter. Just lovely!!! So pretty. I love the blues and grays. This is such a beautiful, serene makeover Carolyn with clean and simple instructions to apply to any makeover. I'm featuring this post at tomorrow's Thriving on Thursday. Thanks for always linking up. Hi Carolyn You've done your bedroom in my favorite colors. I LOVE it! I love your color scheme and the fabrics you have picked out! Lovely room! Oh, I do love that lamp shade cover and the cushions. This is such a beautiful bedroom!